Despite decades of resistance, the Mapuche are still struggling to claim their lands and have their ancestral rights recognized by both governments. The unprecedented mobilization will take place in the beginning of December, in the main cities located on both sides of the border in the Andean mountains, said Moira Millán, representing the Chilean group led by Machi Francisca Linconao in Ngulumapu, and Ingrid Conejero Montecino, representing the March of Native Women for the Well Being in Argentina, in Puelmapu. They both exposed the situation of repression lived daily in the ancestral territories and called for the solidarity of Argentines and Chileans to defend the rights of native peoples. They accused both governments of having criminalized their struggles in the interests of foreign companies in the Patagonia region, with the support of the mainstream media. The ongoing struggle of the Indigenous Mapuche peoples in Argentina and Chile has resurfaced recently with the disappearance of Indigenous leader Santiago Maldonado in early August, and the arrest of another, Facundo Jones Huala. Mapuches from Chile marched insolidarity with their Argentine counterparts in September. In Chile, the Mapuche, who live mainly in the Temuco area of southern Chile, have been in a struggle with the government as they try to regain land lost during Chile’s 19th-century expansion southward into the Mapuche-held territory. Chile’s government has refused to address many of these demands while using an anti-terrorism law to criminalize Mapuche activistsand restrict their right to organize. 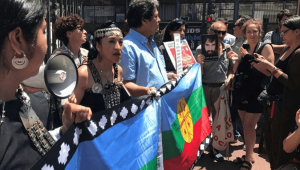 Recently, several members of the Mapuche community have been in hunger strikes protesting against their preventive detention, after they were accused of arson attacks in southern Chile without evidence.